The United States and the European Union have reportedly reached an “agreement in principle” to restrict a share of the EU’s annual 45,000-tonne hormone-free beef import quota exclusively to US product. Politico reported last week that the agreement has been sent to EU member nations for approval. The quota was initially created as a compensatory measure by the EU in 2009 after the US won a World Trade Organisation challenge against the EU’s decision to ban the import of hormone-treated beef, which the US said lacked scientific justification and breached WTO rules. The new quota was created as an “all country” quota to comply with WTO requirements, and over time suppliers such as Australia, New Zealand and Uruguay have gained an increasing share of the 45,000t trade. The US asked the EU to grant it a country-specific share of the 45,000t quota last year, and the EU announced in September it was considering the request. In market talk suggests the EU could grant the US exclusive access to as much as 35,000t of that quota, which would be a significant blow to other suppliers, including Australia which exports more than $200 million of beef to the EU under the existing arrangements. Talks have been protracted since then but a number of reports in the past week indicate the EU and US have reached an “agreement in principle”, which suggests an more progress is being made. A key sticking point for the EU and US in this deal is that any such change would require that all substantial suppliers would have to be consulted and agree on the changes for them to compliant with WTO rules. To date, Beef Central understands, there has been no consultation with Australia. 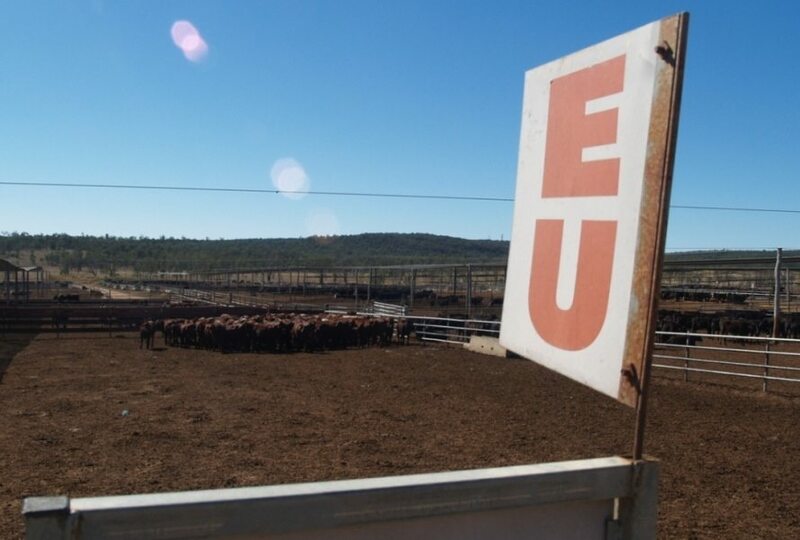 In comments reported by The Australia earlier this week, Trade Minister Simon Birmingham said the reported in-principle agreement between the US and the EU could diminish market access for Australian beef producers. He also made it clear Australia would oppose any plan under post-Brexit trade rules to split quotas Australia currently supplies to both the EU and Britain after Brexit. Senator Birmingham said some goods may be delivered to one EU country but sold elsewhere in the EU, and the new split quota could make it commercially unviable for Australian farmers. “That’s a problem for us ­because we’re not convinced the data is clear on where those goods are actually sold because many do come through a single port and flow elsewhere across the EU. So we think the proposed splits are uncertain at best,” he told The Australian. He said Australia may seek compensation through additional tonnage being added to the quotas or through proposed free-trade deals with Britain and the EU. Senator Birmingham said Australia is awaiting formal consultations with the EU about what exactly is proposed. So we’ve been done over again by the big guys! This will really hit EU producers and feedlots. EU premium has been under a threat for a while this will make it worse. No matter what our pollies say we can’t punch with the big guys when it really counts. 26 million V’s 390 million just doesn’t work. Be interesting to see whether US producers if they supply the market have to comply with the exact same requirements as Australian producers supplying beef to the EU with regards to on farm paperwork and audits and lifetime traceability.